As picturesque, quaint and benign as mushroom foraging sounds, there are some real dangers that can get you killed, badly hurt or put in jail if you are not careful. 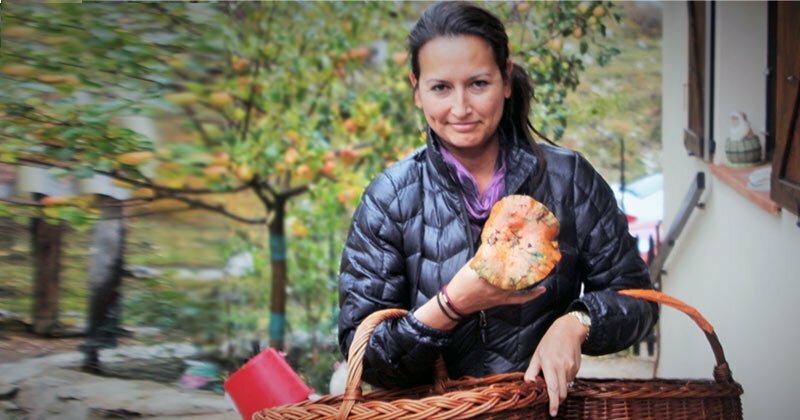 Learn what they are, which tools you can legally use and which wild mushrooms are the most sought after among French mushroom foragers. These mushroom foragers happily wake up in the wee hours of the morning when it’s still dark outside, to dig in the dirt, turn over old leaves and look between trees and bushes in search of their wild mushroom stash for the year. 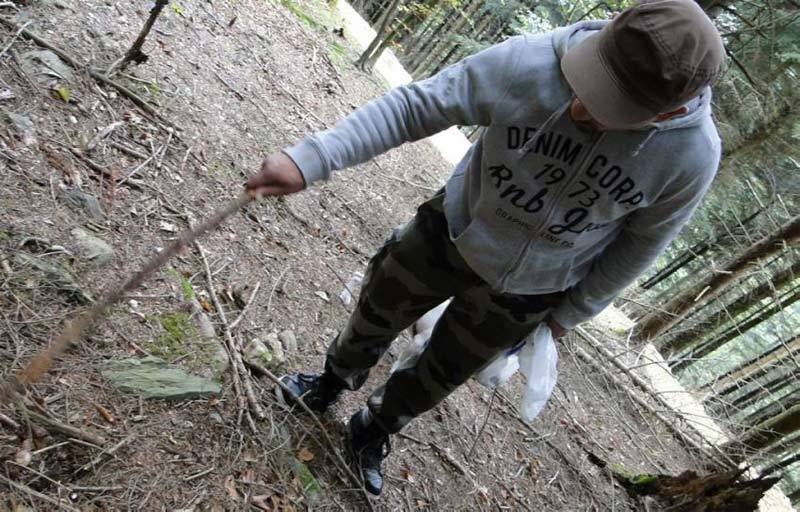 Most will spend a few hours and find a few edible mushrooms while the more serious foragers will spend days on end searching for mushrooms and take home a few kilos. 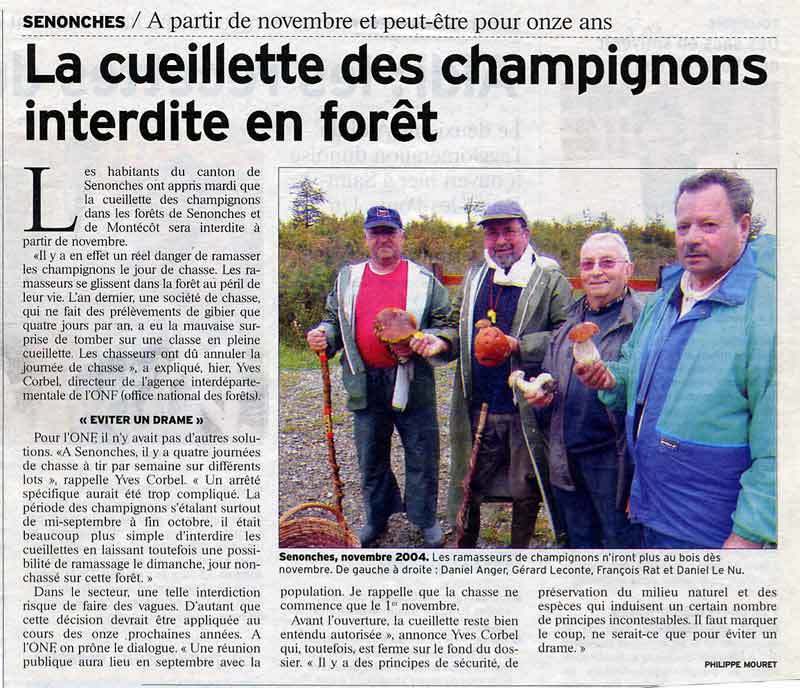 Mushroom hunting or mushroom foraging is called “la chasse aux champignons” or “la cueillette de champignons” is taken very seriously- it’s practically a national past time in France. As picturesque, quaint and benign as mushroom foraging sounds, there are some real dangers that can get you killed, badly hurt or put in jail if you are not careful. 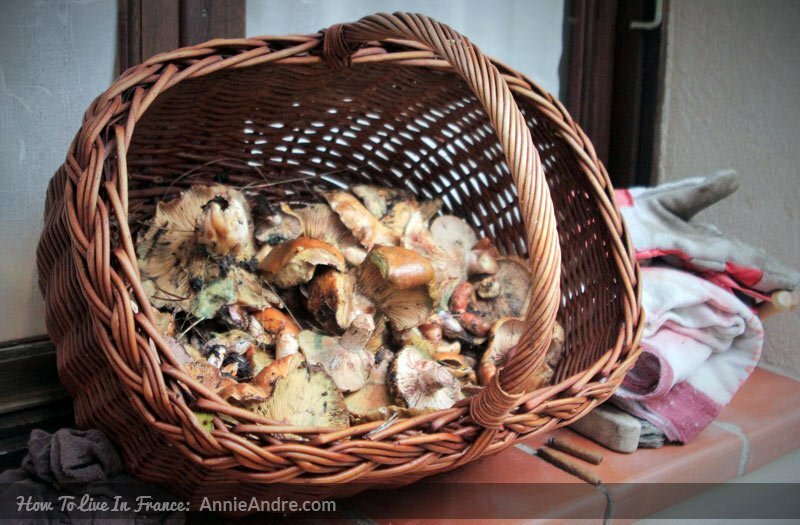 Here is what you need to know before you decide to go mushroom foraging in France. The first and most obvious danger about mushroom hunting is that you can accidentally pick a poisonous mushroom and die. Of the 3,000 plus varieties of mushrooms that can be found in France, only a few are edible. The rests are either poisonous and can kill you or make you extremely ill. 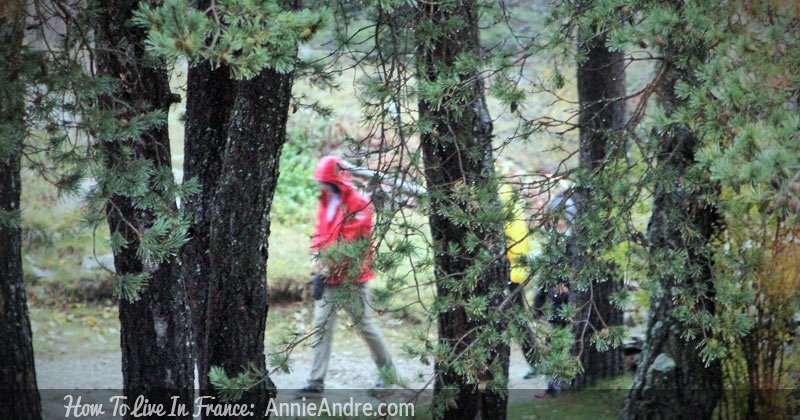 Poisonous or not, this doesn’t stop the French from taking to the hills to gather mushrooms. Every year there are over 1,000 cases of mushroom poisoning and 30 to 40 deaths in France. 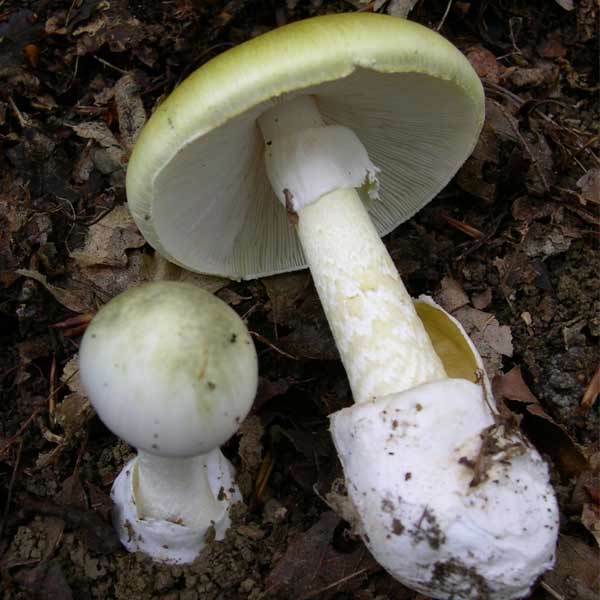 If there is just one mushroom you should commit to memory and avoid like the plage it is the “Death Cap” mushroom which has an equally scary name in French. It’s called “le calice de la mort” which means chalice of death. The death cap is quite possibly the deadliest of all poisonous mushrooms and accounts for 90% of all mushroom poisonings. One single death cap mushroom, can kill an adult. ****These mushrooms may be found on other continents also. Amanita verna, commonly known as the Fool’s mushroom. Amanita virosa, commonly known as the European destroying angel. Entoloma lividum, commonly known in English as the livid pinkgill, leaden entoloma, and lead poisoner. When we went mushroom foraging near a friend’s house in the woods above the city of Cannes, we found a cute little unassuming red mushroom covered with white spots that reminded me of gnomes and fairies. I wanted to pick it but my friend said that it was a hallucinate. It’s called the fly agaric or fly amanita and some people purposely search for them and eat them just to experience its hallucination powers. We didn’t pick one but opted to take pictures of ourselves standing over them just so we could prove we saw one up close. Symptoms can appear up to 12 hours after you’ve consumed your mushrooms and can last for weeks. If you think you might be poisoned from a wild mushroom, you should seek medical help right away. Go straight to the emergency room, call the nearest antipoison centre or dial 15 (in France). If not treated you could actually DIE!!!!!! It’s wise not to pick or eat a wild mushroom if you can’t identify it and there are countless mushroom foraging books to help you identify poisonous mushrooms from edible ones.
. It tells you all you need to get started in mushroom foraging and contains colour photographs of the mushrooms with an identification checklist. It goes further into the subject of foraging and talks about mushroom season, handling, storing, and cooking wild mushrooms. Which edible wild mushrooms should you hunt for in France? Pied de mouton = which translates to Sheep foot because it kind of looks like a sheep’s foot. Sanguins = which translates to blood or bloody because the mushroom has a slight reddish tint to it. Oronges= commonly known in English as Caesar’s mushroom and named so because it was a favorite of early rulers of the Roman empire. Coprin = Shaggy ink cap because it looks like it has ink dripping from its cap. 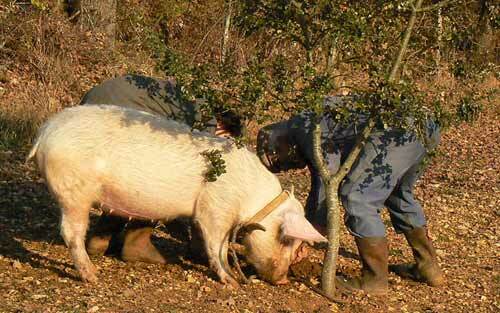 Truffle= Infamously tasty and wildy expensive, finding truffles is like finding gold to a mushroom hunter and just as rare because finding truffles usually involves a trained pig or dog who can smell truffles which are hidden underground and only grow under certain conditions. For anyone who wants to make sure that they have not picked poisonous mushrooms, you can take your mushroom haul to one of the local pharmacies in France. 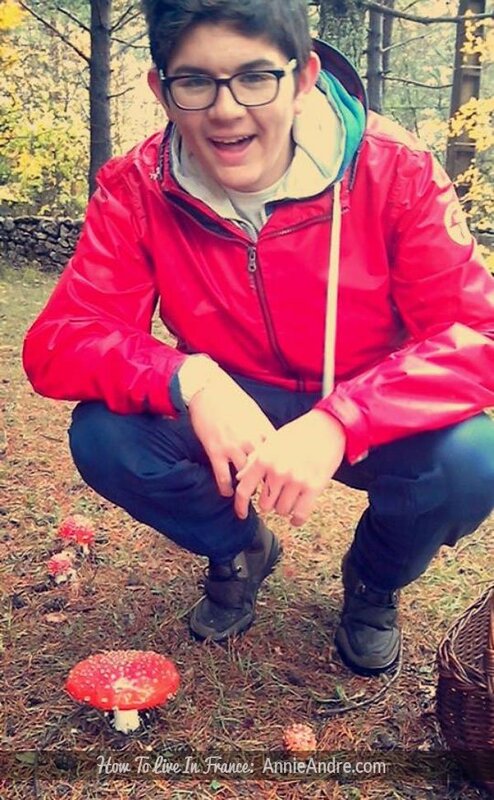 All French pharmacists are supposed to be trained experts in identifying deadly and poisonous mushrooms. Not to scare you but another danger for mushroom pickers is that mushroom season can overlap with hunting season and both can share the same type of terrain (via source) . Every year there are accidental shootings resulting in injury and death. Many are just taking a walk in the forest but at least one or two unlucky mushroom gathers get shot by hunters each year too. 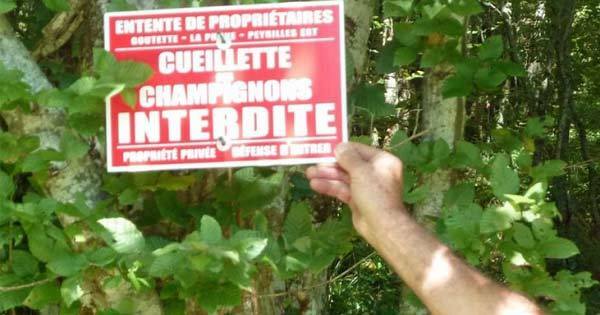 For those who still want to forage for wild edible mushrooms despite the risk of getting shot or poisoned, there is always the wrath of the gouvernement if you are not careful. Picking of wild mushrooms is tolerated in most public forest and national parcs however there are certain rules that you need to adhere to. The same is true if you are caught foraging mushrooms on someone else’s property without their permission. Don’t assume it’s ok to pick mushroom on someone’s property just because there is no fence or signs saying foraging is not permitted. You should always ask the property owners for permission. There have been reported cases of property owners going a little too far and assaulting trespassers. 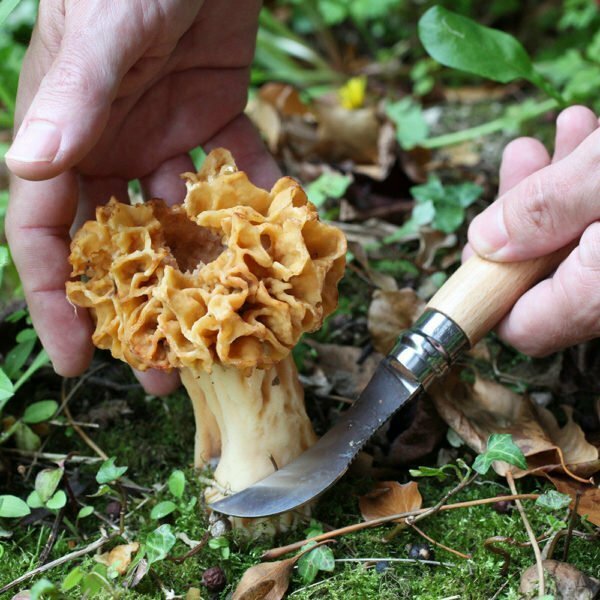 Things you need to forage for wild edible mushrooms. If you’re still up to mushroom foraging despite the dangers and the rules or you know someone who wants to get started mushroom foraging, here are some of the things you’ll need to consider bringing and using. in hand- (called a “panier d’osier” in French). But they’re not only aesthetically pleasing, they are functional too. The wicker baskets allow the spores to fall out as you walk around hunting for mushrooms which in turn is like replanting new mushrooms for foragers. Except for a knife, tools of any kind are frowned upon when mushroom gathering. And if you’re going to get a knife, you might as well get the right kind of knife- a sharp one with a curved blade. Opinel and Laguiole are two French companies which make knives specifically for mushroom hunting. looks similar to a pocket knife because the blade folds into the handle and fits nicely in your pocket. What sets it apart from an ordinary pocket knife is that it has a thin, sharp curved blade with a serrated back which makes it easier to remove the mushroom cuticle (the outer most layer of the skin). It has a beech wood handle with a boar hair brush for easy removal of soil. has 2 blades- a long one and shorter curved one, a corkscrew, bottle and can opener and small brush to remove soil from harvested mushrooms. Clothing is just as important as having a good knife because many of the places you go to forage for mushrooms are areas where walking through dense ground cover will expose your skin to branches that can poke you, shrubs and thorns that can scratch and scrape you and wet ground that can soak and chill you to the bone. that will keep your feet dry. or some random stick to gently spread everything that covers the mushrooms without damaging them during your mushroom hunt. For good measure, a good flashlight or headlamp can come in handy to find those pesky mushrooms hiding in dark places. Preferably one that is water and weather resistant since often times the weather conditions can be wet and rainy. I like the USB rechargeable kind. If you’re not up to the challenge of getting poisoned, shot at, chased off someones property or put in jail, than just do what a lot of French people do. 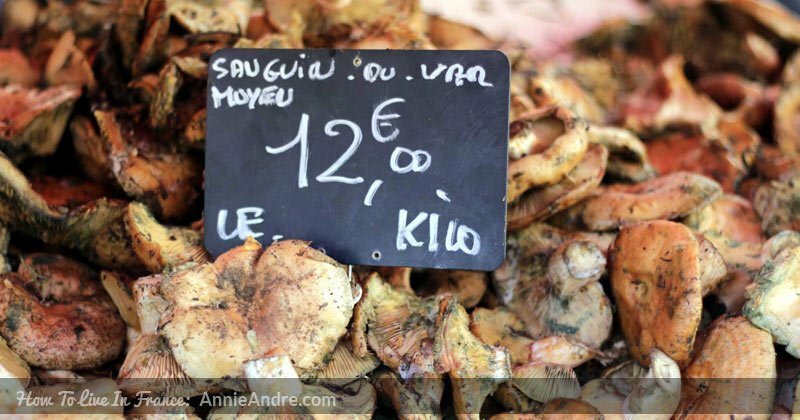 Buy your wild mushrooms at the nearest French market or grocery store. You’ll pay a pretty penny (centime) but it’s worth it. 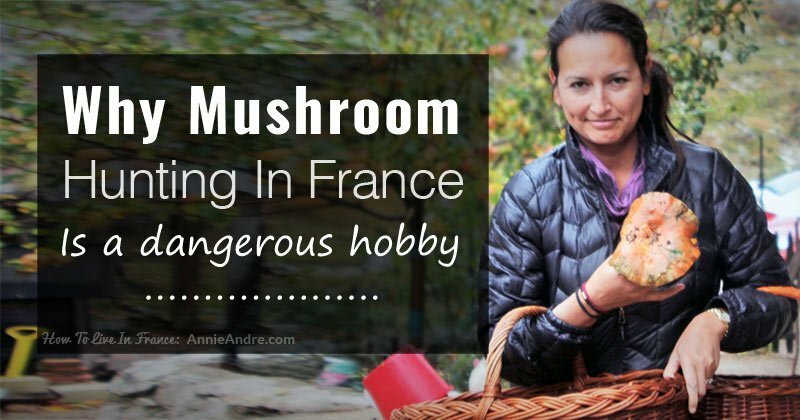 It will give you an idea of what it’s like to forage for mushrooms in France. They never reveal in the video where they went to forage. It’s a secret and they are taunting the audience with their bountiful pickings. Damn them! !